There have been lots of questions, especially among liberals, about when congressional Republicans might turn on President Trump, particularly in the wake of his controversial firing of FBI Director James Comey and the reports late Monday that he compromised classified information. The assumption behind these questions is that at a certain point, something so outrageous will be revealed about Trump that the resulting scandal will … er … trump party loyalty. But, at least historically speaking, even the biggest scandals don’t wash away partisanship. Nixon resigned before the full House voted on impeachment, partly because Republican officials finally began abandoning him. But Nixon didn’t step down until Aug. 8, 1974, more than two years after the Watergate break-in. In the Senate, in turn, party loyalty saved Clinton from being removed from office. Because removal requires a two-thirds majority and Democrats controlled 45 of the 100 Senate seats, 12 Democrats (along with all 55 Republicans) would have had to vote against Clinton for him to be removed from office. But all 45 Democrats voted “no” on both articles. Finally, during Iran-contra, Democrats controlled the House but did not push to impeach the president. Special congressional committees in the House and Senate were created to investigate the Reagan administration’s sale of weapons to Iran and the sending of money to the “contras,” a group fighting the governing regime in Nicaragua.3 There was a final, joint report that blasted the administration for violating a number of laws and suggested that Reagan — whose administration said he was unaware of the actions of his aides — should have known what was going on. The two committees, combined, had 15 Democrats and 11 Republicans. All 15 Democrats but just three of the Republicans signed on to the official report, while eight of the 11 Republicans wrote a minority report dissenting from the majority’s findings. These were three of the biggest scandals in modern American history, and party loyalty stayed strong almost through the end of each. 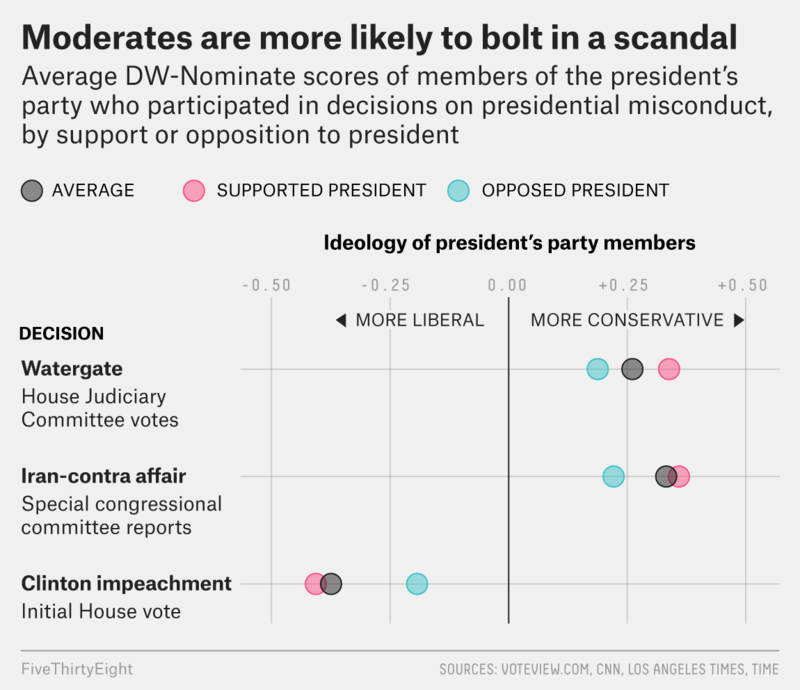 The second trend is that there is an ideological component to party loyalty during scandal. In the simplest sense, more moderate members (in comparison to Congress overall) are more likely to split from a president of their party. Let’s look at the same votes and decisions as above for Watergate and Iran-contra, as well as the vote on the initial impeachment investigation of Clinton’s conduct. (To make a more apples-to-apples comparison, since Nixon and Reagan were never formally impeached.) According to DW-Nominate scores, which measure the ideology of each member of Congress based on roll call votes from previous congresses, the few Republicans who broke with Nixon4 and Reagan were more liberal than the rest of Republicans in Congress then. Similarly, the 31 Democrats who joined Republicans to support the initial impeachment investigation of Clinton’s conduct were generally more conservative than the 175 Democrats in Congress who opposed that GOP proposal. These votes and decisions make for a messy comparison. They were on different actions and came at different points in each scandal’s development. They also had different stakes, which can affect how strongly partisan lines hold. For example, in the Nixon era, the vote to give the House Judiciary Committee subpoena power as part of its investigation was adopted by a 410-4 margin. Still, the idea that at some point party loyalty goes out the window and politicians become nonpartisan statesmen doesn’t hold up historically. Only six of the combined 290 Republicans in the House and Senate back the next most aggressive option, some kind of special committee in Congress (along the lines of the ones created amid Watergate and Iran-contra) or an independent outside group (such as the commission of largely retired officials that investigated the 9/11 attacks). Eighty-five Democrats have called for a special committee or investigation. So essentially almost all Democrats support some kind of ramp-up of the investigation, compared with about 2 percent of congressional Republicans. History also suggests that those who are breaking with Trump, or will do so in the future, are more liberal than other Republicans. That has been true so far as well, with some caveats. In addition to the six who have backed some kind of special investigation, 42 Republicans have said that they had concerns about the Comey firing. These 48 GOP members (15 senators and 33 House members) were more likely to be moderate and somewhat more anti-establishment (meaning they vote against the party leadership on some measures) than their colleagues, according to their DW-Nominate scores. The group of 33 House members is disproportionately associated with the center-right Tuesday Group and includes few from the deeply conservative House Freedom Caucus. Of course, in one sense, we don’t have to guess which Republicans are more likely to break from the president: There was already a big test of loyalty to Trump, less than a year ago. 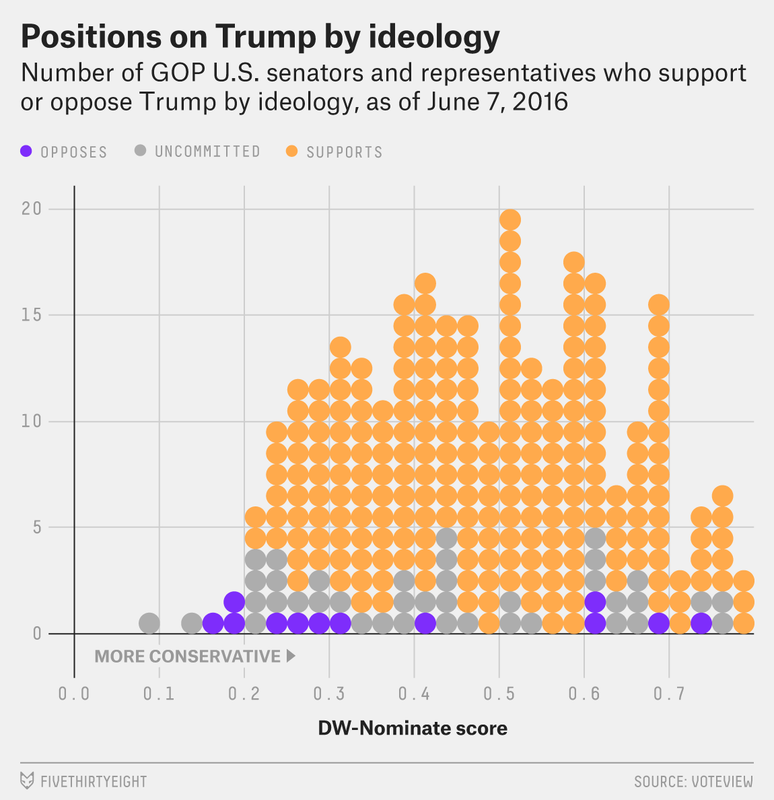 After he won the GOP presidential nomination, a small bloc of senators and House members refused to endorse him, and a disproportionate number came from the left wing of the party. That was in the summer of 2016. The biggest scandal of the Trump campaign came in the fall, with the release of the “Access Hollywood” tape on Oct. 8. The number of anti-Trump Republicans expanded slightly after its release, but the vast majority of Republicans in Congress still supported Trump on Election Day, despite his unpopularity and the series of controversies about his conduct, most notably bragging about sexual misconduct on tape. Who might be the Baker of today? John McCain, of Arizona, is the only Republican in the Senate currently calling for a special committee to investigate the president. Lindsey Graham, of South Carolina, is urging Trump not to pick a GOP politician to replace Comey as the FBI director. Arizona’s Jeff Flake and Nebraska’s Ben Sasse, both during the campaign and last week amid the Comey firing, have questioned Trump’s decision-making and judgment. Overall, though, the lesson from history is simple. In the wake of Comey’s firing, Democrats are encouraging Republicans to “put country over party.” In making this call, they are essentially asking congressional Republicans to do something politicians historically have not: push for punishments and the potential removal of a president from their own party. After a final tape was released more clearly showing that Nixon had known about the cover-up, the House Republicans who voted “no” said that they would have voted for the obstruction of justice charge based on the new information. Remember that impeachment is done by the House in a simple majority vote and is akin to being indicted. The Senate then votes on removal, which requires a two-thirds majority. Clinton was impeached but not removed. Selling weapons to Iran was banned, and the administration was sending money to the contras outside of the congressional authorization process. Counting Republican House Judiciary Committee members who voted for at least one of the articles of impeachment. Tom McClintock, a House Republican from California, has said he supports a special counsel, but only if he or she not only investigates Trump but also Hillary Clinton’s email use as secretary of state and how conservative groups were treated by the IRS during Barack Obama’s tenure as president.